The Tower shares that situations will change rapidly now. Prepare your mind for the change – consciously choose to release your old way of life now. Do not cry about the past, just accept the changes and make new plans. Look forward to the new and wonderful opportunities that will be presented. Your understanding will be awakened by the forceful removal of “wrong” thoughts. Sudden, unforeseen events will overthrow your existing “material” conditions and from this will come rebuilding and understanding, as your lessons are learned and your perception is developed. If you fear your emotions or repress your aggressive drive too long – it will eventually release itself through a violent action – the expression of your aggressive power and drive toward new experiences. Allow your imagination freedom – it is your window of perception through which flashes of insight, intuition and the sudden solutions to your problems arise. Move away from your daily world of habitual living and you will see yourself with new clarity. The unstructuring of your thought allows for the falling away of “limiting” beliefs and creates a breakthrough into new dimensions of awareness, where you become the philosopher using your wisdom to defuse the turmoil within yourself. The “Devil” is not responsible for your “self – control” – your ability to never exceed the limits or take things beyond what your “reason” permits. However, when you seek only to satisfy your material “ego” or indulge yourself in excess and offer no resistance to it – the “Devil” seizes the opportunity of your offence to tempt you and urge you on. If you choose to continue the excess – you begin to build up pressure inside as your unconscious Higher Self strains to be free. Your dreams become disturbed and you become depressed – if not released an explosion will soon follow. Explosions result from long neglected or mishandled situations which strike you at the moment you become vulnerable. The tearing away of these situations is not punishment – but GODs grace, for He will not allow you to stay forever imprisoned in your “illusions” and repressed emotions. When you can not free yourself peacefully – the forces of life arrange that freedom for you through external explosions. If you seek unity with life – then you will need to learn to bring out the life energy which is normally repressed by your conscious personality. When you continually block the flow of this life energy – you leave no other way for it to go beyond the barrier of your conscious mind and break free from that which is cutting you off from the pure life energy contained within yourself. Truth comes all at once or it does not come at all. Release your life energy and you will get past the barriers of repression. Open yourself to the transition – allow your life energy to releases you from the “illusions” and move forward into the light – where the speech of God replaces human speech and revelation replaces the step by step knowledge of your senses. Explosions release you from the “tower” you have created…they lead you to the light of freedom, clearing away situations which have built up intolerable pressure and leading you to new beginnings where enlightenment replaces your limited view of life. You “work” in order to experience growth. You think and then await the growth of your thoughts. You dare to know – then remain silent so that you might hear. We are all confronted with a choice; we can choose to grow without knowing how or we can choose to “do” instead of waiting. To attempt to take our evolution into our own hands and direct it towards a specific aim – choosing the role of “builder” rather than that of “watching over”. A “tower” represents “specialization.” What you have “built” through the efforts of your lower “ego” self will sooner or later be confronted by divine reality. You will be required to undergo the effects of your comparison with it and you will be allowed to “see” clearly and distinctly your own impurities. Look at your beliefs and values and remove the ones that are confining or limiting – the ones the “block” you from experiencing the feelings of joy. As you come to acknowledge your unworthiness before God – the power of His love purifies you and spiritually refines you. To meditate is to “think” in the presence of God. To pray is to “speak” in the presence of God – it is the honest and courageous effort of your “ego” to think together with the “higher” self. Commit yourself to your spiritual growth. Concentration always precedes meditation which leads to contemplation – your union with reality. Complete silence produces union with God. It is the three vows which render concentration, meditation and contemplation effective. The vow of “obedience” – sacrifice of the will, the vow of “poverty” – sacrifice of thought and imagination and the vow of “love” – the acceptance of Gods grace. Suggests that the major lesson involves someone else, someone most likely close to you, but you are involved in them getting this message and/or in the lesson itself. In the second position: Physical health or work, building on a profound event in the past that brought fundamental change, such as the prison experience of Malcom X. In the fourth position: Here was identification at an early age of a voice, a source of inspiration and guidance within. Love for a spirit guide. Strong relationship with self from a past life. Also strong identity with group karma and therefore some members of the group. In the fifth position: Your mind has been jolted. There has been a mental breakthrough. A creative rush. Things are beginning to add up. In the sixth position: This is a jolt in your Emotional Plane in the near future in order to get things where they really want to be. It will be a welcome shakeup. In the seventh position: This could be the mental breakthrough you have been waiting for. In the ninth position: Your heart has been jolted and one of the possibilities is love at first sight – emotions are intense as a result. The nature of this revelation is to cause a change in your emotional house. After this, there should be little doubt as to what the change is, if it hasn’t already taken place. 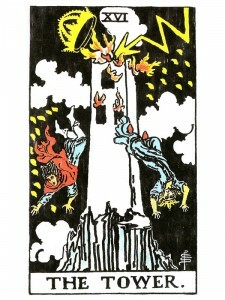 In the tenth position: This is The Tower in its home position and its main message is – listen to your intuition. Do not fear information and shut it out before it can get to you. Let the mind and heart go to work with their processes of validation when you have the message in hand. Every message from God is both specific to your personal needs and general to universal needs. The Tower delivers the messages you have missed and need most to hear. What an empathic and spiritual look at the meaning of the Tower card! Going through the description has helped me immensely during my initial Tarot studies. The only thing I don’t understand is it’s meaning in the eighth position, which happens to be exactly the same for the Temperance card. Is the message indeed the same? Or does the Tower mean something like a blow to the reality of the other through my actions?